This week the JRC Capital Management Weekly Outlook looks on the GBPUSD, also known as Cable. Lately, we have seen some positive news regarding the Brexit. The European Union and Great Britain drafted a comprehensive post Brexit agreement. However, some important points on the agenda remain unsettled and Prime Minister Theresa May is being criticized from her own party as well as from the opposition. Michael Saunders, member of the Bank of England, said that in case of a smooth Brexit, interest rates could rise higher than expected, due to inflationary pressure. An interest rate hike by the Fed in December seems almost safe and thus reflected in the price. On Monday, Mario Draghi and Mark Carney will speak. Speeches by the central bank presidents are always very important and can cause increased volatility. The rest of the reporting week is dominated by US-American data. Such as the consumer confidence on Tuesday and on Wednesday, the trade balance and the gross domestic product. Despite a stronger phase at the beginning of the year, the Cable had to suffer from losses. More than 600 pips in this year, which equals a loss of over 4.5% and the outlook does not look better. Even though the EU and Great Britain agreed on a draft, it will continue to be a tough way. If the Cable continues to fall, a first support area is located at 1.2750, which was already an important level during the last year. In order to confirm the overall downward trend, the bears have to press the price below 1.2650, the low of the year. On the upper side, we can see an important resistance area at the psychological level of 1.3000. 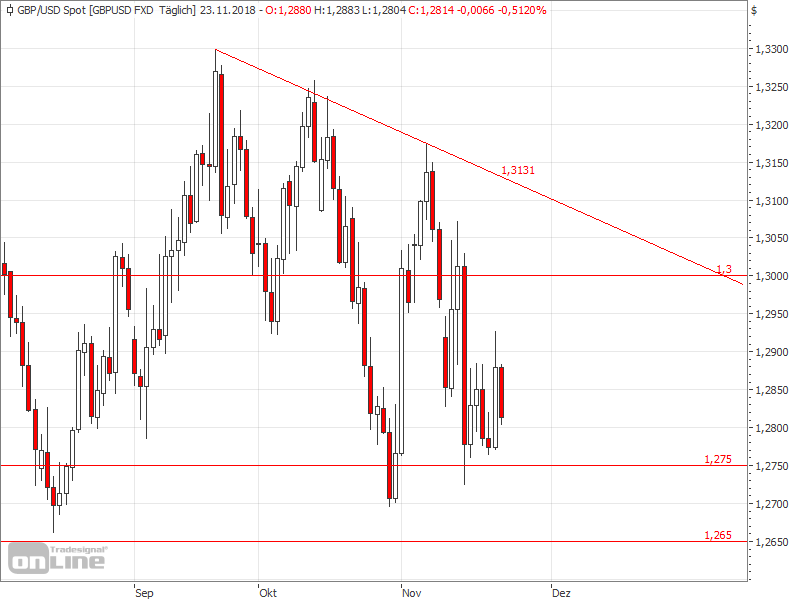 The downward trend line from September currently runs at 1.3131 and could be another important resistance.